An eminent scientist, public person and patron, he was declared the father of modern publishing in Bulgaria. He was born on 7th November 1979 in Haskovo. He descended from a wealthy family of Bulgarian patriots. He was a hero from the siege of Odrin in 1913 for which he was awarded a military cross; he was also a contributor to the University of Sofia and Teachers’ Union. Alexander Paskalev issued the works almost all Bulgarian poets and writers from the Liberation onwards, as well as distinguished names of the European and World literature. 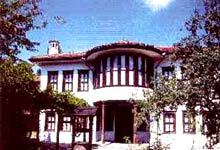 He was in friendly relations with a number of outstanding Bulgarian writers and critics. Along with his rich publishing activity, Alexander Paskalev is also known as a founder of the tourist movement and the first cooperation in Haskovo. After the National Assembly rejected his request for remitting the publishing debts in 1946, Paskalev died poor and lonely in the Haskovo village of Nova Nadezhda. Today, there is literature award on his name.